The headline on a recent piece by Ylan Mui of the Washington Post —“Why the Fed is rethinking everything”—captured the current moment well. The Federal Reserve has indeed been revising its views on some key aspects of the economy, and that’s been affecting its outlook both for the economy and for monetary policy. In this post I document and explain the ongoing shift in the Fed’s economic views. I then turn to some implications, suggesting among other things that, for now at least, Fed-watchers should probably focus on incoming data and count a bit less on Fed policymakers for guidance. Talking about the “Fed’s thinking” is of course very loose. There are few official communications from the Federal Open Market Committee (FOMC) as a whole, and those that exist (such as the statements issued after each FOMC meeting) have the prose style that might be expected of a document prepared by a large committee. The usual practice therefore is to try to infer the FOMC’s policy inclinations from the views expressed by individual FOMC participants in various forums. To quantify changes in the thinking of FOMC participants, I use in this post the Fed’s Summary of Economic Projections, a summary of participants’ forecasts that the Committee releases four times a year. Importantly, standard macroeconomic analysis implies that the three variables above are largely out of the control of the Fed: Potential output growth depends on factors like productivity and population growth, the natural rate of unemployment is determined by various features of the labor market (such as the extent of mismatch between workers and jobs), and, given the inflation rate (which is set by the Fed), the terminal policy rate depends on factors like the rate of return on capital investment and the supply of saving. Changes in policymakers’ estimates of these variables thus reflect reassessments of the economic environment in which policy must operate. So how has the Fed’s thinking changed? 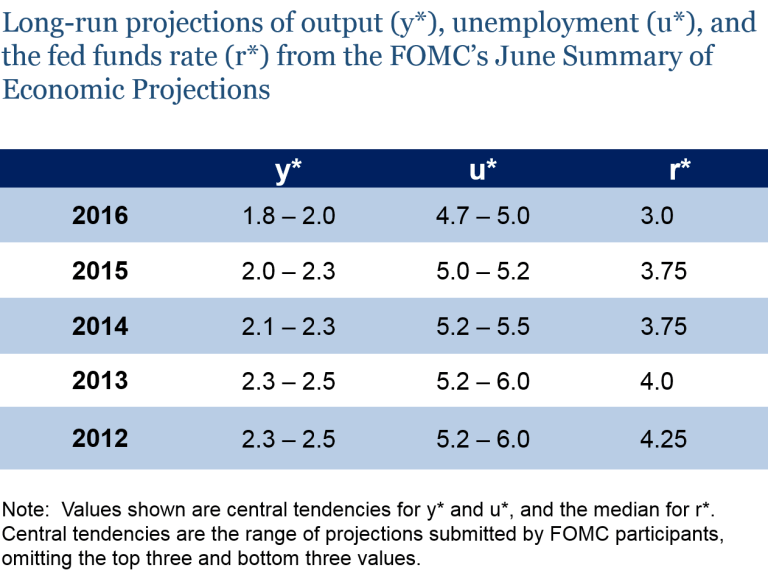 The table below shows long-run projections of output (y*), the unemployment rate (u*), and the federal funds rate (r*) made by FOMC participants in June 2016 (the most recent available) and in each June of the prior four years. The changing views of FOMC participants (and of most outside economists) follow pretty directly from persistent errors in forecasting economic developments in recent years:As the table shows, FOMC participants have been shifting down their estimates of all three variables—y*, u*, and r*—for some years now. The declines in the past year have been particularly striking: Based on the midpoints of the central tendency ranges in the table, between June 2015 and June 2016 the typical participant marked down her estimates of both y* and u* by 0.25 percentage points, while the median estimate of r* dropped by 0.75 percentage points. Cumulatively, over the past four years, estimated y* has fallen 0.5 percentage points, estimated u* has declined 0.75 percentage points, and estimated r* has fallen by a substantial 1.25 percentage points. Relative to the underlying variables, these are large changes: For example, over a ten-year period, a potential growth rate of 2.4 percent (the middle of the 2012 range) cumulates to about a 27 percent total gain in output, whereas at 1.9 percent (the 2016 estimate) cumulative growth in ten years is instead about 21 percent, equivalent to a difference of about $1.1 trillion in GDP (in 2016 dollars). 1. Estimates of potential output growth (y*) have declined primarily for two reasons. First, potential growth depends importantly on the pace of growth of productivity (output per hour). Unfortunately, productivity growth has repeatedly disappointed expectations during this recovery. For example, in 2009, leading scholars were predicting productivity growth in the coming years of about 2 percent per annum ; in fact, growth in output per hour worked has recently been closer to half a percent per year . It’s possible that productivity may recover, of course, but if it doesn’t, then potential growth rates in the future will be lower than had been expected earlier. Second, although Fed forecasters have been too optimistic about output growth in recent years, they have also been, interestingly, too pessimistic about unemployment, which has fallen faster than expected despite the slow rise in GDP. Generally, the unemployment rate tends to fall when output is growing faster than its potential—a basic macroeconomic relationship known as Okun’s Law. The observed combination of slow output growth and rapid unemployment declines can be consistent with Okun’s Law only if growth in potential output has been lower than thought. 2. The downward revisions to estimates of the natural unemployment rate (u*) largely reflect the fact that inflation has come in lower than forecast in recent years. According to the so-called Phillips curve, another basic macroeconomic relationship, inflation should rise when unemployment is persistently below u*. In 2012, as the table above shows, estimates of u* by FOMC participants centered around 5.6 percent. However, despite the facts that the unemployment rate fell below 5.6 percent in February 2015 and has been at or below 5 percent since last October, inflation has not increased, at least not to the extent expected. Although multiple factors influence inflation, one way to reconcile the recent behavior of inflation and unemployment is to revise down one’s estimate of the natural unemployment rate. 3. Downward revisions in the estimates of the terminal or neutral fed funds rate (r*) also have multiple sources. Slower potential output growth implies lower returns to capital investment, and thus a lower r*; and indeed the pace of business investment has been disappointing, especially recently. A lower value of r* could also help explain the relatively sluggish pace of actual output growth, since it would imply that current policy is not as stimulative as previously thought (i.e., the current policy rate is not as far below r* as was believed). FOMC participants also pay attention to market signals: Low longer-term market interest rates imply that investors see a continuation of low real returns, low inflation, and low risk premiums on safe forms of debt, all of which point to a lower federal funds rate in the long run. What are the implications of these revisions for monetary policy and Fed communications? Over the past couple of years, FOMC participants have often signaled that they expected repeated increases in the federal funds rate as the economic recovery continued. In fact, the policy rate has been increased only once, in December 2015, and market participants now appear to expect few if any additional rate rises in coming quarters. What happened? Market commentary on FOMC decisions typically focuses on short-run factors, such as the uncertainty created by the recent vote in the United Kingdom on whether that country should leave the European Union. While such factors do affect the meeting-to-meeting timing of monetary policy decisions, they can’t account for extended deviations of policy from its expected path. The more fundamental reason for the shift in policy trajectory is the ongoing change in how most FOMC participants view the key parameters of the economy. The two changes in participants’ views that have been most important in pushing the FOMC in a dovish direction are the downward revisions in the estimates of r* (the terminal funds rate) and u* (the natural unemployment rate). As mentioned, a lower value of r* implies that current policy is not as expansionary as thought. With a shorter distance to travel to get to a neutral level of the funds rate, rate hikes are seen as less urgent even by those participants inclined to be hawkish. Likewise, the decline in estimated u* implies that bringing inflation up to the Fed’s target may well take a longer period of policy ease than previously believed. The downward revisions in estimated u* likely have also encouraged FOMC participants who see scope for further sustainable improvement in labor market conditions. The downward revisions to estimates of y* have mixed implications for policy. On the one hand, lower potential output growth suggests that slow GDP growth may not be due primarily to inadequate monetary or fiscal policy support for aggregate demand, but rather reflects constraints on the supply side of the U.S. economy. If y* is truly independent of Fed policy, as the standard textbook analysis assumes, then a lower estimate of y* implies less scope for monetary policy to increase growth and greater risk of inflationary overheating if monetary ease continues for too long. On the other hand, as mentioned earlier, the recent decline in productivity growth (and thus in potential output) has been both large and mostly unexpected. Some have hypothesized that this decline is not purely exogenous but has been influenced, to some extent, by short-term economic conditions. For example, the slow recovery from the Great Recession likely impeded capital investment, business formation, and the acquisition of skills and experience by workers, which in turn may have contributed to the disappointing pace of productivity gains. The converse possibility, that stronger economic growth today might have positive and lasting effects on the economy’s ability to grow, is for some an argument for erring on the side of more stimulative policies. The bottom line is that, broadly speaking, FOMC participants’ views of how the economy is likely to evolve have not changed much: They still see monetary policy as stimulative (the current policy rate is below r*), which should lead over time to output growing faster than potential, declining unemployment, and (as reduced economic slack puts upward pressure on wages and prices) a gradual return of inflation to the Committee’s 2 percent target. However, the revisions in FOMC participants’ estimates of key parameters suggest that they now see this process playing out over a longer timeframe than they previously thought. In particular, relative to earlier estimates, they see current policy as less accommodative, the labor market as less tight, and inflationary pressures as more limited. Moreover, there may be a greater possibility that running the economy a bit “hot” will lead to better productivity performance over time. The implications of these changes for policy are generally dovish, helping to explain the downward shifts in recent years in the Fed’s anticipated trajectory of rates. FOMC communications also have been affected by the recent revisions in the Fed’s thinking. It has not been lost on Fed policymakers that the world looks significantly different in some ways than they thought just a few years ago, and that the degree of uncertainty about how the economy and policy will evolve may now be unusually high. Fed communications have therefore taken on a more agnostic tone recently. For example, President Bullard of the St. Louis Fed has recently proposed a framework which implies that, in most circumstances, economic forecasters can do no better than to assume that tomorrow’s economy will look like today’s. Other participants, noting earlier failures of forecasting, have argued that (for example) policy should not react until inflation has actually risen in a sustainable way , as opposed to being only forecast to rise. In general, with policymakers sounding more agnostic and increasingly disinclined to provide clear guidance, Fed-watchers will see less benefit in parsing statements and speeches and more from paying close attention to the incoming data. Ultimately, the data will inform us not only about the economy’s near-term performance, but also about the key parameters—like y*, u*, and r*—that the FOMC sees as determining that performance over the longer term. The two reasons are not really independent: Both turn on the fact that when productivity growth is low, then, by definition output grows slowly relative to labor input. Potential output growth also depends on the growth rate of the labor force. However, the slower pace of labor force growth was widely anticipated and thus incorporated into forecasts of potential growth for some time. Roughly, Okun’s Law says that if GDP grows one percentage point faster than potential GDP, then the unemployment rate will fall about one-half percent per year. The idea that the current level of economic activity can have persistent effects on potential output has been dubbed “hysteresis.” Larry Summers is both an originator and a recent proponent of the idea. It’s also received some support from researchers at the Federal Reserve .